My weekend started off with a with a Friday evening showing of “Super 8.” Nate loved it, and I agree wholeheartedly with my movie-maven Moira McDonald’s review. After the show we had a hankering for Korean food and ended up at Chung Sol in Lynnwood for barbecue and an impressive array of banchan. And oh, Sunday morning. Coffee. A leisurely reading of the Sunday papers. Don’t I wish: too much on the agenda. That said, by day’s end, I devoured several great cover stories you should not miss. 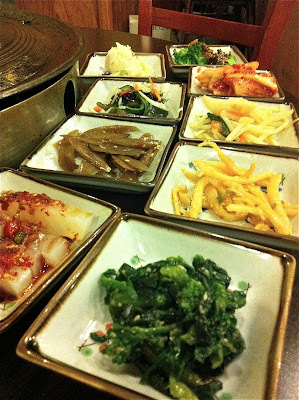 Banchan (aka Korean side dishes) at Chung Sol, and my Sunday papers, providing much food for thought. And what can I say about the New York Times’ Sunday Travel section coverage of the Seattle-area food scene? That it was beautiful and brilliant. That Frank Bruni wrote a love story about our city and its restaurants (including several I adore). That I’m insanely jealous he’s gotten to the Willows Inn on Lummi Island and I have not yet been. Yep. That about sums it up. Read his take right here.